Meanwhile, social media campaigns have been launched to target those who have been rioting and looting. 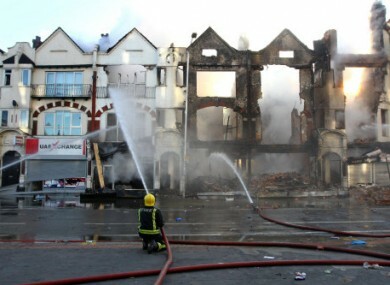 The scene in Croydon, Surrey, this morning following last night's unrest. A 26-YEAR-OLD man who was shot during the unrest in Croydon, Surrey, last night has died from his injuries. The BBC reports that the man was found in his car last night and that an investigation into the death has been launched. A post-mortem examination has found that the man whose death sparked this week’s riots in London died from a single gunshot wound to the chest, the Guardian reports. Mark Duggan, 29, was initially reported to have died during an exchange of fire with police officers. However, it transpired that a bullet found in an officer’s radio was a police-issue round thought to have passed through Duggan’s arm. The Telegraph reports that it is understood that Duggan had not fired on police, as early reports stated, but had produced a weapon which was found at the scene. An inquest into Duggan’s death was opened this morning and adjourned until mid=December. Three days of rioting began on Saturday evening after a peaceful protest over Duggan’s death and spread from London to other cities in England, with disturbances reported last night in Briston, Birmingham and Liverpool. The Metropolitan Police in London have launched an online appeal for people to identify those involved in the violence. CCTV images of rioters and looters are being posted to the police Flickr page. Hundreds of people have been arrested since the violence erupted. Meanwhile, a Twitter campaign has begun which also aims to ‘name and shame’ people who took part in the riots and a dedicated tumblr page ‘Catch A Looter’ has been set up to try to collate images of looters. A Twitter campaign to organise people who wanted to help clean up the city areas damaged in the riots has generated tens of thousands of followers today. David Cameron, who returned to London early from a family holiday for crisis meetings on the riots, announced this morning that 16,000 police officers will patrol the streets of London tonight. The prime minister also warned that the people responsible for the violence and damage would “feel the force of the law”. Email “Man injured in London riots dies as inquest into Mark Duggan death opens”. Feedback on “Man injured in London riots dies as inquest into Mark Duggan death opens”.